April 11, 2019. Husband of 61 years, to the late Rose M. Pyeritz. Father of Glenn, Donna, and the late Daniel Pyeritz. Grandfather of Christopher, Nicole, Korrie and Kurt. Great-grandfather of Kinley, Genevieve, Adalynn, and Cavan. Brother of Paul, Don, Roy, Jean, and Flo; as well as many extended family members and close friends. Son of his late Parents, Paul and Bertha Pyeritz. 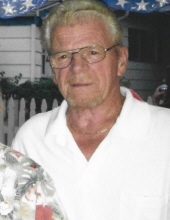 Visitation will be held on Sunday, April 14, 2019 from 1 to 6 pm at the Jefferson Memorial Funeral Home, Inc., 301 Curry Hollow Rd, Pleasant Hills. In lieu of flowers, please consider a donation in Ed's honor to St. Jude Children's Research Hospital at www.stjude.org. Condolences may be left at www.jeffersonmemorial.biz. To send flowers or a remembrance gift to the family of Edward A. Pyeritz, please visit our Tribute Store. "Email Address" would like to share the life celebration of Edward A. Pyeritz. Click on the "link" to go to share a favorite memory or leave a condolence message for the family.